Professor Peter Howarth is Professor of Allergy and Respiratory Medicine and Honorary Consultant Physician within Medicine at the University of Southampton. 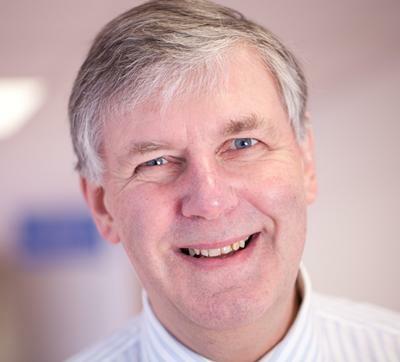 Professor Peter Howarth is Professor of Allergy and Respiratory Medicine and Honorary Consultant Physician with a clinical and research focus on asthma, particularly severe asthma, and allergy. He is Head of the Clinical Studies Forum in the Clinical and Experimental Science (CES) Research division within the Faculty of Medicine, coordinating clinical and translational human based research as well as clinical trials, lead for “Airways disease” within the CES research division and area lead for “Airways disease” within the NIH funded Respiratory Bioscience Research Unit in Southampton. Professor Howarth has funding from the MRC, National Institute of Health Research, EPSRC and Asthma UK as well as Industrial funding for his research that addresses the understanding and treatment of severe asthma. Much of this work makes use of direct airway sampling at bronchoscopy to obtain samples for the evaluation of the airway microbiome, airway inflammatory status, airway remodelling and to obtain samples for ex vivo cell culture studies. Such studies focus, in collaboration, on bronchial epithelial cells, airway mucosal fibroblasts and alveolar macrophages. These approaches have been used both to compare findings in severe asthma to that in healthy controls and mild asthma as well as to evaluate the impact of standard and novel therapeutic approaches to disease management. On-going work also includes biomarker evaluation and evaluation of novel approaches to lung imaging in airways disease. Professor Howarth has supervised over 20 PhD and DM students (scientists and clinicians) and his research involves Local, National and International collaboration. He has participated in EU funded collaborative programmes, such as BIOAIR and GA2LEN, focusing respectively on severe asthma and allergic diseases, and is joint work package 4 lead for UBIOPRED, the EU/EFPIA funded IMI programme on severe asthma. Professor Howarth has published over 200 peer reviewed papers and lectured extensively at National and International specialist society meetings as an invited speaker. Professor Howarth coordinates the MRC funded Wessex Severe Asthma Cohort, a well characterised group of over 300 patients with treatment resistant asthma, established to facilitate basic science and interventional studies in severe asthma. Professorr Howarth is joint lead for the Difficult Airways Service in Southampton, providing a secondary and tertiary referral service for treatment-resistant asthma, and established the Clinical Allergy Service providing a clinical Allergy and Immunology service for the Wessex region. This close patient involvement provides the basis for the translational research programme and the appreciation of the unmet clinical needs. Professor Howarth is regional advisor on allergy training and a member of the standing advisory committee for Allergy and Immunology at The Royal College of Physicians. Professor Howarth has contributed to National, European and International (World Health Organisation) guidelines on the management of rhinitis and asthma. He has been on the council of The British Society of Allergy and Clinical Immunology, advisor on allergy to Asthma UK and has been chairman of the board of trustees of Allergy UK. He is currently President of Allergy UK and a trustee of AAIR. My research is focused on the pathophysiology and pharmacology of airways disease This research is aimed at better understanding the pathophysiology of clinical disease expression, the impact of current and novel therapies on the disease process and the identification of biomarkers to aid in diagnosis, disease monitoring and in early phase clinical trials as surrogate end-points. 11) Biomarker detection (EPSRC funded UOS interfaculty nanotechnology award and involvement in EU/EFPIA Innovate Medicines Initiative (IMI) UBIOPRED programme). The bronchoscopic evaluation of airway remodelling changes before and after repeated experimental bronchoconstriction in asthma with allergen and methacholine has demonstrated the relevance of mechanical compressive forces within the airways to epithelial activation, mesenchymal signalling and fibroblast activation (NEJM 2011; 364: 2006-15). This has significant implications for the long term management of asthma and further prospective studies evaluating the effect of sustained bronchoprotection in preventing the progression of airway remodelling and decline in lung function in asthma are proposed. A controlled clinical trial evaluating the impact of recombinant Keratinocyte Growth Factor (KGF) on the epithelial repair response and downstream effects on markers of airway wall remodelling will complete by the end of the year. The identification of an altered airway microbiome within the airways in treatment-resistant severe asthma (collaboration Dr Ken Bruce) and immune responses directed towards bacterial components (collaborations Professor Claus Bachert and Professor Robert Clancy) have opened up new avenues for therapy in treatment-resistant severe asthma and clinical trials are being planned for vaccine intervention against non-typeable Haemophillus influenzae (collaboration with Hunter Institute) and anti-IgE therapy in aeroallergen defined non-atopic asthmatics who have evidence of IgE against bacterial products. To better understand the basis for the altered microbiome in asthma and the relevance of this airway environment to the innate immune response, evaluation of epithelial and macrophage markers of activation are being studied in asthma of differing severity and under circumstances of stable and exacerbated disease. The relevance of disease-related changes in MiRNA to the altered activation profile is under study (collaboration Dr Tilman Sanchez-Elsner). I am closely involved with WP3 (clinical recruitment and characterisation) and WP4 (bronchoscopic airway sampling) components the European collaborative IMI funded U-BIOPRED project and will have responsibility for the adult contribution to these WP programmes from Southampton. This will identify biomarkers of disease phenotype in severe asthma. Southampton initiatives I am involved with, e.g. silicon nanowire array sensor programme (EPSRC funded led by Professor Peter Ashburn) and impedance spectroscopy for blood cell analysis (Phillips funded led by Professor Hywel Morgan and Dr Judith Holloway) will provide avenues to point of care translation. In addition through MRC funded (programme grant) and RBRC funded work the value of imaging as a biomarker to define disease phenotypes is being investigated in asthma and COPD, evaluating not only external imaging but also endobronchial imaging with endobronchial ultrasound and probe-based Confocal Laser Endomicroscopy (pCLE) to evaluate the airway structure. A collaboration has developed with Dr Julian Moger (University of Exeter) and Professor David Shepherd (optoelectronics research centre, UOS) to assess whether additional probe based approaches to airway wall assessment could be developed, based on Microelectromechanical systems (MEMS) and Coherent anti-Stokes Raman scattering spectroscopy (CARS). Takahashi, K., Pavlidis, S., Ng Kee Kwong, F., & U-BIOPRED Study Group (Accepted/In press). Sputum proteomics and airway cell transcripts of current smokers. European Respiratory Journal. Takahashi, K., Pavlidis, S., Kee Kwong, F. N., Hoda, U., Rossios, C., Sun, K., ... Chung, K. F. (Accepted/In press). Distinct pathways underlying neutrophilic inflammation in smoking-associated severe asthma in U-BIOPRED. European Respiratory Journal. Bousquet, J., Schunemann, H. J., Fonseca, J., SAMOLINSKI, B., BACHERT, C., CANONICA, G. W., ... MERCIER, J. (2015). MACVIA-ARIA Sentinel NetworK for allergic rhinitis (MASK-rhinitis). Allergy, 70(11), 1372-1392. Nam, Y-H., Lee, S. K., Sammut, D., Davies, D. E., & Howarth, P. H. (2012). Preliminary study of the cellular characteristics of primary bronchial fibroblasts in patients with asthma: expression of alpha-smooth muscle actin, fibronectin containing extra type III domain A, and smoothelin. Journal of Investigational Allergology and Clinical Immunology, 22(1), 20-27. Beckett, P. A., & Howarth, P. H. (2003). Pharmacotherapy and airway remodelling in asthma? Thorax, 58(2), 163-174. Salib, R. J., & Howarth, P. H. (2003). Safety and tolerability profiles of intranasal antihistamines and intranasal corticosteroids in the treatment of allergic rhinitis. Drug Safety, 26(12), 863-893. Howarth, P. (2002). Antihistamines in rhinoconjunctivitis. Clinical Allergy and Immunology, 17, 179-220. Watson, L., Margetts, B., Howarth, P., Dorward, M., Thompson, R., & Little, P. (2002). The association between diet and chronic obstructive pulmonary disease in subjects selected from general practice. European Respiratory Journal, 20(2), 313-318. Redington, A. E., Roche, W. R., Madden, J., Frew, A. J., Djukanovic, R., Holgate, S. T., & Howarth, P. H. (2001). Basic fibroblast growth factor in asthma: measurement in bronchoalveolar lavage fluid basally and following allergen challenge. Journal of Allergy and Clinical Immunology, 107(2), 384-387. Puddicombe, S. M., Polosa, R., Richter, A., Krishna, M. T., Howarth, P. H., Holgate, S. T., & Davies, D. E. (2000). Involvement of the epidermal growth factor receptor in epithelial repair in asthma. FASEB Journal, 14(10), 1362-1374. Redington, A. E., Wilson, J. W., Walls, A. F., Madden, J., Djukanovic, R., Holgate, S. T., & Howarth, P. H. (2000). Persistent airway T-lymphocyte activation in chronic corticosteroid-treated symptomatic asthma. Annals of Allergy, Asthma and Immunology, 85(6), 501-507. Roberts, J. A., Bradding, P., Britten, K. M., Walls, A. F., Wilson, S., Gratziou, C., ... Howarth, P. H. (1999). The long-acting beta2-agonist salmeterol xinafoate: effects on airway inflammation in asthma. European Respiratory Journal, 14(2), 275-282. Bradding, P., Feather, I. H., Wilson, S. J., Bardin, P. G., Heusser, C. H., Holgate, S. T., & Howarth, P. H. (1993). Immunolocalization of cytokines in the nasal mucosa of normal and perennial rhinitic subjects. The mast cell as a source of IL-4, IL-5, and IL-6 in human allergic mucosal inflammation. Journal of Immunology, 151(7), 3853-3865. Djukanović, R., Lai, C. K., Wilson, J. W., Britten, K. M., Wilson, S. J., Roche, W. R., ... Holgate, S. T. (1992). Bronchial mucosal manifestations of atopy: a comparison of markers of inflammation between atopic asthmatics, atopic nonasthmatics and healthy controls. European Respiratory Journal, 5(5), 538-544. Jones, T., Brown, T. P., Elliott, S. P., Rupani, H., Chauhan, A., Gove, K., ... Howarth, P. (2017). Cell counts in severe asthma: concordance of sputum and BAL in Wessex Severe Asthma Cohort. European Respiratory Journal, 50(Suppl 61), [OA3218]. Jones, T., Brown, T., Elliott, S., Rupani, H., Chauhan, A., Barber, C., ... Howarth, P. (2017). Characteristics of eosinophilic severe asthmatics in the Wessex Severe Asthma Cohort (WSAC). European Respiratory Journal, 50(Suppl 61), [PA4042]. Jones, T., Brown, T., Elliott, S., Barber, C., Gove, K., Lau, L., ... Izuhara, K. (2017). Predictors of sputum and BAL eosinophilia in the Wessex Severe Asthma Cohort. European Respiratory Journal, 50(Suppl 61), [PA4765]. Barber, C., Lau, L., Ward, J., Tariq, K., Gove, K., Rupani, H., ... Howarth, P. (2016). The use of bronchoalveolar lavage (BAL) to assess lower airways inflammation in asthma. European Respiratory Journal, 48(Suppl 60), [PA1838]. Gove, K., Brown, T., Rupani, H., Barber, C., Kurukulaaratchy, R., Chauhan, A., & Howarth, P. (2015). Assessment of small airways dysfunction with impulse oscillometry, multiple flow nitric oxide and spirometry in the Wessex severe asthma cohort study. European Respiratory Journal, 46(Suppl 59), [PA1580]. Barber, C., Lau, L., Elliott, S., Ward, J., Gove, K., Brown, T., ... Howarth, P. (2015). Correlation of inflammatory markers of disease with sputum neutrophilia in severe asthma. European Respiratory Journal, 46(Suppl 59), [PA599]. Tariq, K., Barber, C., Gove, K., Rupani, H., Brown, T., Kurukulaaratchy, R., ... Howarth, P. (2015). Role of gastro-oesophageal reflux in severe asthma: Experience from the Wessex severe asthma cohort. European Respiratory Journal, 46(Suppl 59), [PA4578]. Brown, T., Rupani, H., Barber, C., Elliott, S. P., Gove, K., Lau, L., ... Howarth, P. (2014). Dissociation between clinical trial inclusion and exclusion criteria for trials in severe asthma and the reality of the patient population. European Respiratory Journal, 44(Suppl 58), [P3326]. Rupani, H., Lau, L., Ono, J., Ohta, S., Barber, C., Elliott, S. P., ... Howarth, P. (2014). Serum periostin in asthma: A potential biomarker for stratification in severe treatment-resistant asthma. European Respiratory Journal, 44(Suppl 58), [P3986]. Barber, C., Elliott, S., Ward, J., Gove, K., Brown, T., Rupani, H., ... Howarth, P. (2014). Sputum neutrophil differential cell count in health and relationship to disease severity in asthma. European Respiratory Journal, 44(Suppl 58), . Lau, L. C. K., Lwaleed, B. A., Cooper, A., Salib, R. J., Voegeli, D., Kambara, T., ... Walls, A. F. (2011). Inhibition of mast cell mediator release in the presence of honey. Poster session presented at International Mast Cell and Basophil meeting: European Mast Cell and Basophil Research Network and European Cooperation in Science and Technology, Southampton, United Kingdom. Sun, K., Hakim, M. M. A., Kong, J., de Planque, M. R. R., Morgan, H., Roach, P. L., ... Ashburn, P. (2010). Low cost nanowire biosensor fabrication using thin film amorphous silicon crystallisation technologies. Poster session presented at IDRN, United Kingdom. Joint course coordinator for “Airways disease module” involved in delivering curriculum, student support, lectures, assignments and marking. Lecture on Foundation module.